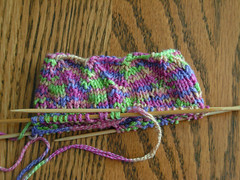 flame wave socks from interweave knits favorite socks. my gauge is exact – when i use a size 0 (US) needle. vs. the size 4 (US) called for. and the yarn used in book is only a little lighter than the panda cotton (186 yd/50g vs. 170yd/50g.) yet another confirmation that i knit loosely. however, it seems to be working out and to be fun. so far.